Measurements such as pressure, temperature, conductivity, and UV absorbance for in-line analysis in single-use formats have been used in biopharmaceutical development and manufacturing for many years. These measurements align with other single-use technologies such as bags, tubing, and filters to form complete assemblies. The availability of single-use sensors is necessary to drive implementation of single-use technology from development through to GMP manufacturing. Single-use sensors have gained widespread acceptance by offering the same benefits, ease of use, and convenience as other single-use assembly components, while providing the accuracy and robustness of traditional measurement techniques. Stating that a sensor is single-use should not imply it is not robust. The term single-use is more related to product design, cost, and manner of use. The design of single-use sensors should be such that the costly sensing electronics are reused as extensively as possible. This can be effectively accomplished by housing the electronics of the sensor in its monitor or transmitter instead of within the single-use sensor itself. By designing in this way, the cost of the sensor can be optimized by minimizing how much of its components are disposed. Finally, how the sensor is used will impact its design. Single-use sensors cannot be calibrated in line the way traditional gauges can be calibrated, since single-use systems are not amenable to the introduction of potentially contaminating fluids into the flow path. However, single-use sensors are manufactured under tight tolerances and with repeated testing for accuracy during their manufacture. In some cases, a calibration constant can be determined for a single-use sensor (conductivity, flow) and entered into a suitable monitor. Otherwise, single-use sensors must be used knowing that calibration is not required, or even possible. Materials of construction used in the flow path of single-use sensors provide another level of robustness for single-use sensors. Highly durable and chemically inert plastics such as polysulfone and polycarbonate comprise the bulk of the flow path in most single-use sensors. Other materials commonly used in flow paths include stainless steel and glass, where required. All single-use sensors must also meet the requirements of biocompatibility, bioburden reduction treatments, and the long-term storage stability necessary for practical adoption of the sensors by the biopharmaceutical industry. The growth of continuous processing in biopharmaceutical manufacturing, coupled with the benefits of single-use technology (SUT), create demand for SUT sensors that have a proven performance record for long-term use. The challenges for SUT sensors in continuous bioprocessing include the time in process for a sensor when the continuous process has a long duration (i.e., as seen in a perfusion bioreactor), and whether the materials are durable enough to be exposed to process fluids for long periods of time. Additionally, the sensing elements cannot be susceptible to drift/change over time and must remain accurate throughout the lifetime of the operations. To demonstrate the performance of SUT sensors over time, laboratory studies on single-use pressure and conductivity sensors were carried out to provide data showing that the sensors will maintain their accuracy in continuous biomanufacturing operations. In a related study, the long-term stability and accuracy of a UV/Vis/near-infrared spectroscopy (NIR) photometer was determined. Twelve single-use pressure sensors from three different lots representing two different materials of construction (polycarbonate and polysulfone) were held with a regulated pressure at 10 psi for 93 days. Data were logged continuously to spot any anomalies, and daily readings were recorded. At the end of the 93 days, the pressure was removed, and the atmospheric value was noted. The 12 sensors were then retested from 0 to 60 psi with the National Institute of Standards and Technology (NIST)-traceable equipment without retaring to 0 psi. The data from the accuracy retest are shown in Table 1. The results show all 12 sensors are well within their stated accuracy specifications after 93 days of exposure to 10 psi, and they returned to near zero psi when exposed to atmospheric pressure. Table 1. 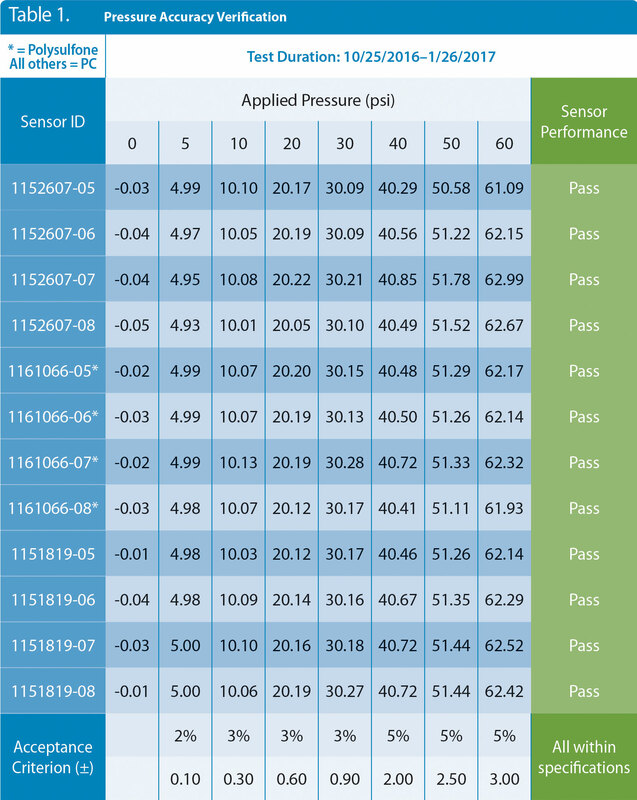 Pressure data from 12 sensors that were in continuous use for 93 days. The sensors were challenged with air through a NIST-traceable gauge and show excellent agreement with stated accuracy claims after the 93-day test period. NIST = National Institute of Standards and Technology. A 35-day static continuous laboratory test was carried out on single-use conductivity sensors to provide data demonstrating that the sensors will maintain their accuracy with long-term use. Commercially available NIST-traceable solutions of 2 mS and 15 mS were added to the flow paths of two sensors, and the ends were capped. Readings were taken daily over 35 days while the sensors remained at ambient conditions. At the end of 35 days, the solutions were carefully transferred to new sensors and then measured for changes in the conductivity of the test solutions. The solutions showed a slight drift to higher values of 2.3 mS and 16.3 mS over the 35 days; most likely due to some evaporation of water from the cells. However, the final readings of the sensors under test were identical at 2.3 mS and 16.3 mS. Additionally, fresh 2 mS and 15 mS buffer was introduced into the sensors under test, and they read 2 and 15 mS, respectively. These results indicate no change in values over 35 days at ambient temperature. The UV/Vis/NIR system consists of a photometer with wavelength-specific LED light source, fiber optic cables and optical couplers, and a flow cell. The flow cell contains no electronics, so for the long-term accuracy study reported here, the photometer and cables were the units under test, not the flow cell itself. A photometer equipped with a 280-nm LED, cables, and couplers were attached to a flow cell and allowed to operate normally with 100% UV light transmissions through the flow cell for 93 days at room temperature. Data were continuously recorded and inspected daily for abnormalities. Maximum drift over the 93 days was <0.1 AU. At the end of the 93 days, the accuracy of the photometer was determined by challenging it with NIST-traceable UV standards without taring the unit. The results, presented in Table 2, show the photometer remained within specification following the extended operation. Table 2. 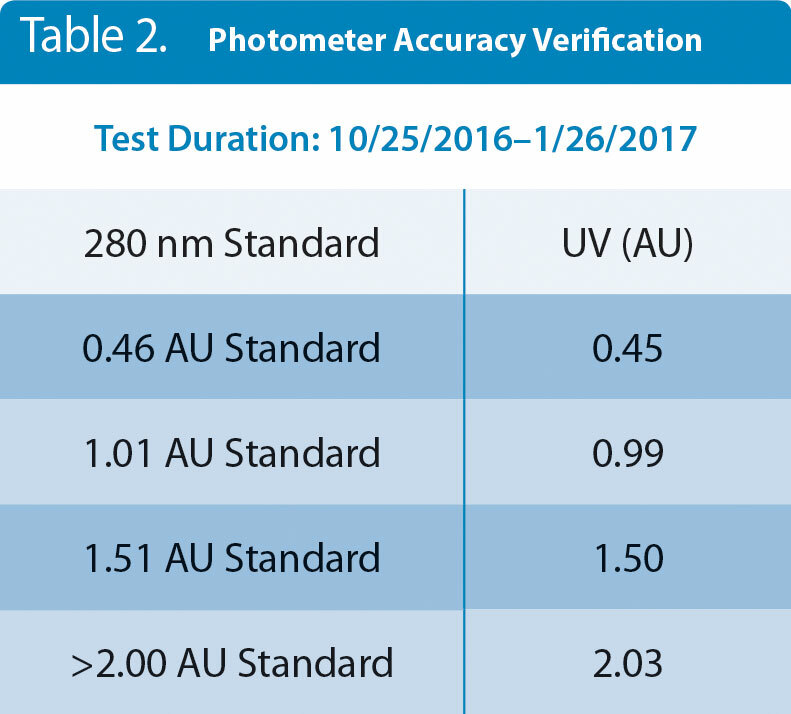 Accuracy vs. NIST standards of a 280-nm UV photometer after being in continuous service for 93 days. Single-use sensors represent robust technologies that can be considered for qualification in GMP processes. They have established themselves as viable alternatives to traditional gauges in biopharmaceutical development and manufacturing, and are well positioned to support the growing interest in the implementation of continuous bioprocessing. Their physical and functional integrity over extended periods of operation time have been demonstrated, and they can complement other single-use technologies in continuous unit operations. Qualification of single-use sensors for specific process conditions and/or process fluids is recommended. Dennis C. Annarelli, Ph.D., is a technical manager and Joshua Huang is a product test engineer at PendoTECH, Princeton, NJ.